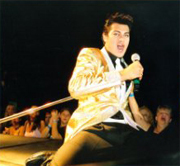 Joseph's young looks makes him a natural for the 50's and 60's music of Elvis; but, his love and passion for the Las Vegas years drives him to master the captivating songs that mesmerized the audiences of that era. His mind, heart, and spirit are at one with Elvis. With his meteoric rise and performances that truly win and woo his audiences, we cannot wait to see where this blossoming star's rocket ship will land. Who knows the heights to which Joseph's talent will soar? Joseph E Hall, 23 years old, resides in Lincoln, NE. Born and raised in Texas, Joe grew up in a hard-working, loving family with a love of theater and music. With the backing of his family, he had an opportunity to launch his singing career in October, 2006. What started out as a costume party and Joe's first gig has launched him into a full-time career. Over 50 shows later, having competed in 6 contests and placing in the finals in all 6, Joe has catapulted into the public limelight at rocket speed. He also earned a spot in the first Ultimate Elvis Tribute Artist Contest. 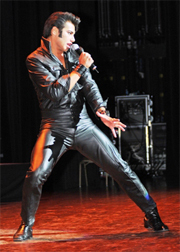 Joe Hall, third place winner of the 2008 Ultimate Elvis Tribute Artist Contest, will be competing on NBC’s America's Got Talent.